Jubilee was an organisation that valued co-authorship and encouraged cross-disciplinary practice. It was unusual in this respect, using the term multimedia long before it was related to computer technology. In respect of this, the images are licensed for use by others under the Creative Commons licence ‘Attribution Non-commercial’ (CC BY-NC), but not for commercial reproduction. We have not attached individual credits to images – as in some cases we don’t know who took them – but some would certainly have been taken by some of the members listed below. Steve Trow, Chrissie Poulter, Steve Lacey, Kate Organ, Malcolm Ratledge, Peter Wooldridge, Sandy Young, Jill Tolley, Victoria Wood, David Purvis, Martin Dennis, Ceri Cunningham, Andy Wilson, Dave Tilley, Sally Eldridge, Dave Bache, Ian McFarlane, Virginia Brown, Chris Travers, Ken Lloyd,Tessa Gearing, Melanie Grafton, Mel James, Steve Chapman, Cynthia Woodhouse, Peter Emina, Martyn Overs, Peter Chaplin, Mark Renn, Derek Jones, Sandra Jones, Gary Wiltshire, Cath Staincliffe, Sharon McDermott, Harry Henderson, Sylvia King, Steve Gooch, Horace Rodney, Dee Murphy, Tony Stanley, Gary Stewart, Lorraine Griffiths, Chris Jones, Conrad Schwarz, Cilla Jinks, Brendan Jackson, Beverley Harvey, Maxine Walker, Nigel Madhoo, Peter Singh, Fiona Bailey, Jeevan Singh, Cath March, Eric Klein Velderman, Pete Yates, Ron Collins, Len March, Ken Reid, Lorraine Griffiths, Sue Green, Prem Singh, Sakab Bashir, Carrie Carruthers, Ian Smith, Graham Peet. 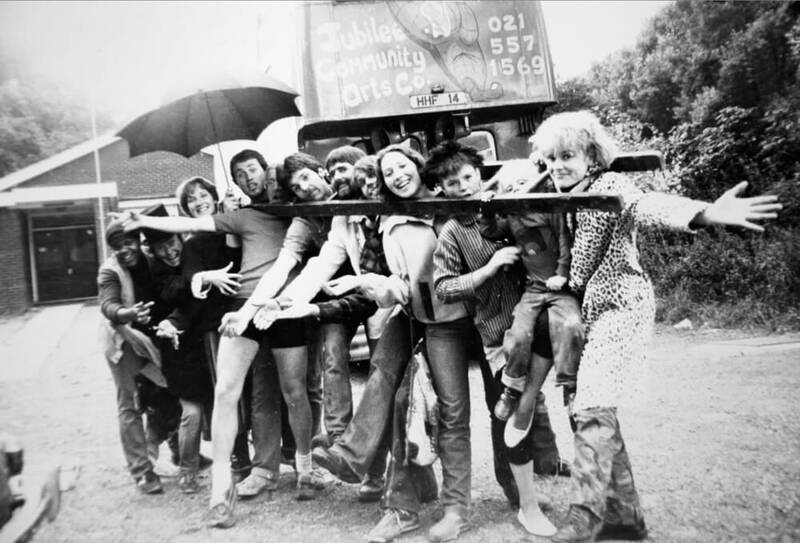 The Bus Team, Summer 1981, outside their base at Farley Park Lodge, Greets Green. Thanks to our participants and volunteers in 2014-15: West Bromwich Local History Society, Rounds Green Reminiscence Group, Friends of Rounds Green Library, Tipton Local History Society, Tipton Library and Heritage Centre, Central Library, Sandwell College Performing Arts Department, Stone Cross Library, Tibbington T.A., Sandwell Trades Union Council, St Paul’s Primary School, Hall Green Primary School, Glebefields Library, Black Country Echoes Festival; Omar Saleem, Peter Maguire, Claire Rothwell, Liam Pye, Geoff Wesson (CHAS Exhibition), Matt Whitehouse, Cat Fuller (Tipton Exhibition), Brian Wilkes, Moreen Wilkes, Robert Hazel, Deborah Worley, Marie Belfort, Michelle Blackhall, Jacqueline Hawkins, Richard Slaughter, Angela Tombs, George Hickman, Paul Moore, Brian Dakin, Derek Jones, Cath March, Martin Prestidge, Kelly Cranston, John Edwards, Peter Chaplin, Ron Collins, Members of Art Club at Langley Lodge, Chris Flood, Sheena Taggart, Dr John Middleton. Special thanks to Kate Organ, Steve Trow, Pete James, Deb Slade, Paul Quigley and Steve Johnson and Frances Land from Black Country Touring for their advice and support. Project Artists: Chris Baldwin, Ania Bas, Geoff Broadway, Rich Franks, Helen Sweeting. Web: Paul Lacey, Peter Wesolowski, Brendan Jackson. Brendan Jackson directed the project. He has worked as an artist and developer of community arts programmes with a range of statutory and non-statutory organisations, producing a wide range of projects where community engagement was paramount. He was a project director of Jubilee Arts in the 1990’s, winning a BAFTA as producer of ‘Lifting The Weight’, and a Health of the Nation award for ‘Asthma Attack’, an interactive health information programme. His expertise lies in photography and film, oral history, writing and new media. He held a Fellowship in Photography from Southampton University and has undertaken significant projects in the museums and heritage sector. He works both locally and internationally, in recent years with Warsaw University and the Borderland Foundation in Eastern Europe. Beverley Harvey co-ordinated the project. She has great experience in community engagement projects, recently delivering a two year participation project aimed at nurturing and training volunteers with Women of Wolverhampton and Low Hill and the Scotlands Neighbourhood Partnership. Local Regeneration Partnership. She has undertaken several oral history projects with the Black and Asian communities in the West Midlands. She is an accredited assessor within the creative/cultural industries and an experienced trainer in the voluntary sector. She currently delivers a variety of training programmes for ethnic minority women. She has initiated volunteer strategies for a number of NGO’s and educational establishments, including Special Olympics Great Britain working with Kingston College; and previously co-ordinated a Heritage Lottery project ‘I-land life’ for Friction Arts, an oral history project reflecting stories of migration. Beverley joined Jubilee Arts to develop the ‘Bickle’ project, previously being involved with the Community Association of West Smethwick. Both these particular members of Laundry worked extensively with Jubilee in the 1990’s as initiators, programme managers and project directors and thus have specialist knowledge of the source of the material and its provenance through their peers. Paul Lacey & Peter Wesolowski are our web experts. Each with over 15 years experience working in the creative arts & web industry, they works in all areas of web design, web development, e-strategy & online marketing. Paul began his career with Jubilee at the end of the 1990’s working on educational web sites and later set up his own web design collective alongside Peter. The collective is called The Dickiebirds Web Studio. Paul has worked on a number of web projects with Laundry – his web site is plmcreative.com. Ania Bas is an artist who creates situations that support dialogue and exchange, her work testing and exploring frameworks of participation. She is interested in the ways that narratives shape understanding, mythology and knowledge of places and people. Her works take forms of text, events, walks, performances, useful object and publications. She is co-founder of The Walking Reading Group on Participation and is an Open School East associate (2013-2014). She has worked with a number of galleries including Tate, Whitechapel Gallery, ICA, Yorkshire Artspace and The New Art Gallery Walsall. We originally met her on a project partnered by Jubilee Arts and the Institute of Polish Culture at Warsaw University in 2001. Ania worked with Rounds Green Library and Langley Lodge on storytelling based on reminiscences of play. Chris Baldwin is an international director and playwright reorganised for his work in Teatro de Creacion. In this kind of theatre emphasis is placed upon the social and transformative nature of both rehearsals and performance. Many of his productions incorporate whole cities or valleys and take place in almost any space – except theatres. He has worked in the UK, Germany and Spain. He currently the Director of Performance for Wroclaw European City of Culture 2016. He is also a Visiting Professor at Rose Bruford College of Theatre and Performance and the author of five books on theatre. As part of the archive project, Chris undertook conducted a week long masterclass with performing arts students at Sandwell College, leading to a street performance, using images from the 1970’s and early 1980’s as the starting point. Geoff Broadway works with the moving image, photography, audio, and interactivity. Much of his work involves connecting with individuals and communities to reflect elements of everyday life and how we make sense of the world around us. Working with Tipton Library and Heritage Centre, he made a film, which was installed as part of an exhibition of the archive materials – a reflection of people’s thoughts and recollections about Tipton. Helen Sweeting is a Photographic Artist. Her practice explores how people interact and respond to their surrounding environment and in turn how the surrounding environment influences individuals. She has completed a number of arts residencies and commissions over the past 15 years, including work for Arts Council England: West Midlands, Arts Council England: North East and Library of Birmingham. Helen has worked with other artists from Laundry on community engagement projects across the region. She also lectures in Photography and Art and Design at Sandwell College and works as a freelance artist. She works with sound-bites, text and still images, exploring notions of identity and belonging along the way, in both her personal and community engagement work. For this project, she worked with a group of aspiring photographers at Sandwell Community History and Archives Service, exploring the materials and selecting photographs from the collection. The volunteers went on to produce a series of curated and creative works in response to the Archive, culminating in an exhibition at Smethwick Library. He has over fifteen years experience managing and delivering creative projects in the West Midlands. Prior to this in his formative years he worked for Jubilee Arts delivering projects in design, community engagement and education. Rich designed the finale exhibition for the Arts Cafe Space in West Bromwich, utilising 70’s style graphics and typefaces. Blue and White Creative works predominantly within the health, regeneration and heritage sectors, where they have delivered and managed award winning projects including ‘Same Again’ British Medical Association Award for Innovation and “A Walk In The Park’ West Midlands Arts and Health Award for Environments.